6. Reimbursed by health insurance? Health insurers would save fortunes by supporting people who want to heal themselves. For over 40 years, hundreds of studies have shown that TM is particularly effective to improve health and prevent diseases. The TM research is really just the scientific evidence of the strength of our own body to heal itself. Transcending simply activates this inner healing power. Health insurers (and ultimately the taxpayer in the case of public health care) could save a fortune if they would financially support those who want to learn how to keep themselves healthy, rather than supporting them when it is already too late. Prevention is always much cheaper than cure. Yet in spite of all the scientific evidence, a TM course is still not reimbursed in the Philippines. Insurance. This has more to do with political reasons than with scientific reasons: the lobby of those branches of the health industry that would lose money if people would discover that they are far more powerful to heal themselves than they could ever have imagined. We, as a non-for-profit organization (registered as a non-profit educational foundation in the Philippines), do not have the resources to set up a counter lobby and this would also go against our principles. We can only offer something that works, and hope that enough people will put pressure on the health insurance funds and on the government to support it. In the mean time, we have found a number of private sponsors who can support people in financial need. For more information on the TM-course, course contributions and sponsorships, go to TM course. Here are some of the most impressive studies demonstrating how much money could be saved. A large-scale study in Canada, linked 1400 TM practitioners to 1400 control individuals of the same age and risk category. 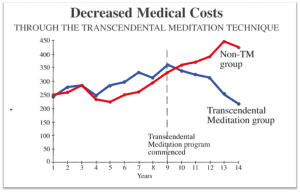 The study followed the health expenses of both groups over 14 years, 9 years before the TM practitioners started with TM, and the next 5 years. Before they started with TM, their expenses were slightly higher than those of the control group, but as soon as they learnt how to use the TM technique, their expenses began to decline. After 5 years, their expenses were even 50% lower. For the older TM practitioners (older than 65 years), which is generally the most expensive group for the health care system, the expenses were even almost 70% lower. Another large-scale study in the U.S., where 5 years of health statistics of 2000 TM practitioners were compared with the standard, came to a similar conclusion: a 50% decrease in hospital admissions for the younger group and a 70% decrease for the TM practitioners who were more than 40 years old. The more detailed statistics showed a significant lower hospital admission rate for all disease categories except childbirth, including a 60% reduction in cancer and a 87% reduction in heart-disease. However, the most impressive studies about TM are the studies about the cardiovascular diseases in collaboration with the National Institutes of Health, the health research centre of the American government. During the last 20 years, they have spent more than $ 25 million US, specifically on the research on the effects of TM on blood pressure, diabetes, arteriosclerosis and heart disease, to come to the conclusion that it works, and that it is the only alternative method that really appears to work. This means: obtaining the same or even better results as the ones that can be obtained with medication but much cheaper and without side effects. A randomized controlled study of 5 years with 200 heart patients found out that, among the 100 TM practitioners, there were 48% fewer cases of heart attack, stroke or death, a result that has never been seen before with a purely mental technique. Cardiovascular diseases are by far the most expensive health problem out there. This was a study with existing heart patients who only learnt about TM when the problems had already occurred. Based on these results, the American Heart Association now formally recommends that TM be considered in the treatment of hypertension and heart disease.